Michael Watkins, owner of Fitness Together where I train with a personal trainer, was talking about how recently he's been consistently inconsistent. He's had his own personal things going on in his life, as we all do, but it was something I could totally relate to. I've been consistently inconsistent for over a year now. This last year I've struggled with the transition of working with different trainers, and then when he closed the downtown studio adjusting to a new trainer as well as going back to all 5:15 am sessions. Please don't think I'm blaming anything on anyone else, because everyone at FT was there for me when I needed them, it just was an adjustment I didn't do well with. This past month or so I've done a lot of self reflecting, as well as figuring out what I need to do to get back on track. One thing I realized is I've gotten away from a lot of those good habits, as well as not really following a meal plan. So, in looking at what I should do to start getting results again, as I have gained some of my weight back, I asked myself "What was I doing when I got my best results?" and "What was I doing when I was feeling my best?" And to answer those two questions, I was getting my best results when I was doing carb cycling and I always felt my best when I was taking the Advocare supplements. So what I decided to do, and I started this week, is to combine the two things and see what kind of results I get in 8-weeks. I had a few people asking exactly what I'm doing and so I decided to post it here so others will know, but also for accountability. I'll make sure to give weekly updates on my progress. I'll be weighing in weekly each Saturday. And then my trainer will do my measurements every two weeks. 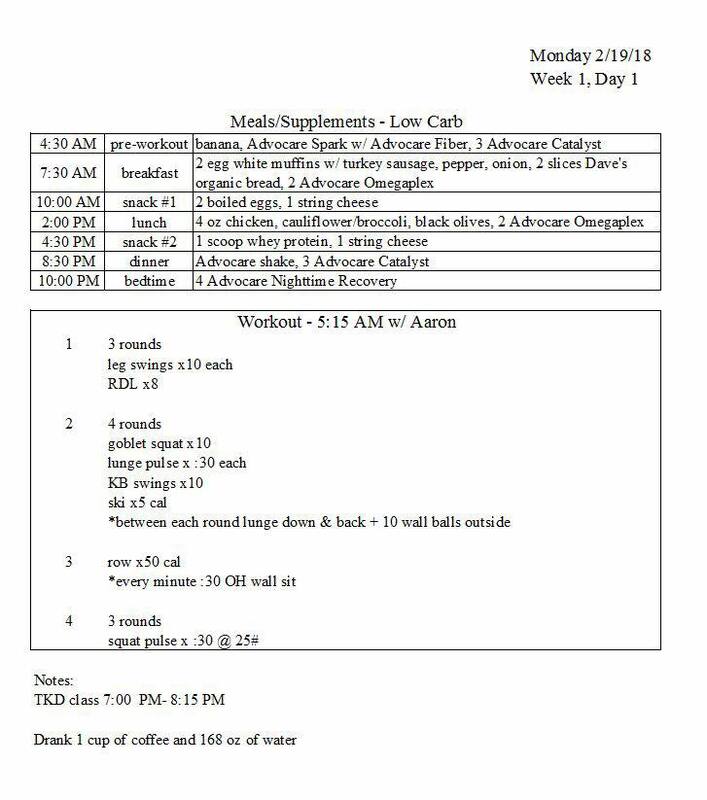 To make sure I'm staying on track, I'm doing a strict nutrition and workout journal and then sending it daily to my trainer. If this is something you are interested in doing, I suggest you get an accountability buddy that you will report to, and if you don't they hold you accountable by asking for your journal or how your weigh-in went. If you don't know of anyone you truly feel will help you and hold you accountible, I can be your buddy, just ask. So, what exactly am I doing? 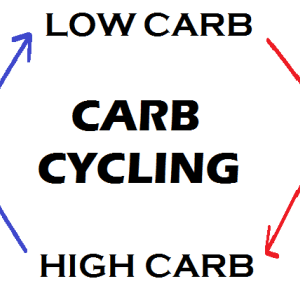 Well, Carb Cycling is basically cycling out low and high carb days. By Carb Cycling you can set your metabolism to "high" on high carb days and keep it from slowing down too much on low carb days. (This explanation is from Michael Watkins who provided me the Carb Cycling plan) There are two templates, the Basic and then the Turbo. Then there is a what they call a Slingshot week that you do every 4th week of the cycle. I'll now list the templates, what each meal will consist of, what I'm doing over the next 8-weeks including the Advocare, and a snippet of an example of what and how I'm journaling. But, what does a Low Carb vs. a High Carb day look like? Well, it's actually pretty simple. On high carb days you're mainly eating protein, healthy carbs, and veggies for your meals. And on low carb days you're getting a healthy carb for breakfast, but after that you're getting your protein, healthy fats, and veggies. Now, that's the Carb Cycling, and as in regards to the Advocare supplements as you can see from my journal I drink an Advocare Spark with the Advocare fiber to get extra fiber that I need, Omegaplex with breakfast and lunch, Catalyst before my morning workout and dinner, and then of course before bed the Nighttime Recovery. You can get great results just by following the Carb Cycling plan, but if you are interested in the Advocare products for the additional supplements click on the link below. Michael Watkins, who I've trusted my own personal health and fitness for the last seven years, is a distributor and this is his link to the products. You can check the products out and feel free contact him with questions, or you can shoot me a message and I can get any information for you. So, now you're probably asking, "What template should I use?". Well, you need to always make sure you're following something that supplements your activity level as well as what your goals are. Starting with the Basic plan is the typical recommendation, and then when you plateau can change to the Turbo plan. Again doing the Slingshot week once every 4th week. Last time I did Carb Cycling, which I did for almost 3 years, I did the Basic plan for several months and then went to Turbo for a couple months, then back to Basic. But, as I mentioned I'm actually doing something a little different and will see what kind of results I get over the next 8-weeks. So here's what I'm doing. I will be posting weekly weigh-in updates and then updates every two weeks on my measurements. I think I've covered it all from how to follow the Carb Cycling plan to what exactly I plan on doing. If you have questions, feel free to shoot me a message.